Most of the laksa stalls outside now use rice vermicelli aka “laksa beehoon” which is made from rice flour with a bit of tapioca starch added for chewiness. I was told by an old Baba that the very traditional laksa used whole rice grains soaked overnight before being ground to form a thick slurry which was then mixed with fresh fish meat before being pressed through a mould. The texture was described as a hybrid of the current laksa noodles and freshly made fishballs. This is no longer in practice of course and sliced fish cake is now added as a standard condiment. Not many know that the latter is really a substitute for the real deal. 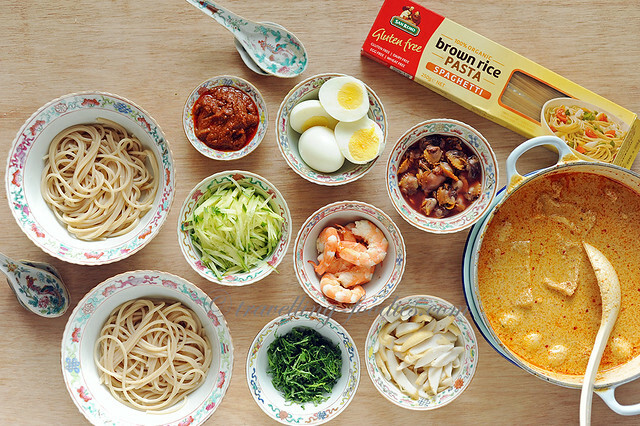 Nowadays in the market we can find “healthier” versions for the laksa noodles which are made from unpolished brown rice. For today’s rendition, I’d used San Remo’s Gluten-free Brown Rice Spaghetti instead which is in essence the same as the brown rice rice vermicelli, unconventional it seems but I especially enjoyed the additional dimension of chewiness and springy textures the spaghetti provides which you don’t get in traditional laksa noodles. If the “al dente” textures bothers you, simply cook the pasta for a little longer, i.e. 2-3 minutes more than the prescribed time on the packaging, i.e. 9-11 minutes for the pasta to soften further slightly. The standard spread of toppings and condiments for a traditional bowl of laksa is pretty elaborated I must say. Apart from fried beancurd puffs aka tau pok and fishballs which were already added into the gravy, the other ingredients would include hardboiled eggs, sliced fishcake, julienned cucumber, fresh prawns, and Vietnamese mint leaves aka daun kesum. 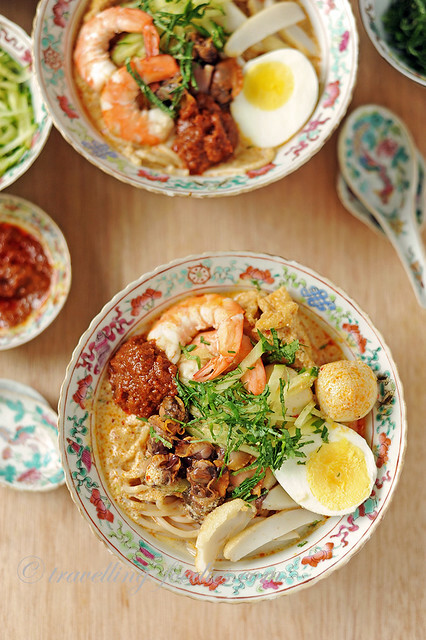 The last item is often referred to locally as “laksa leaves” owing to its association with this noodle dish. And of course the quintessential blood cockles aka “see hum” is a must for a decent bowl of laksa alongside a wicked dollop of sambal chili to take the heat up a notch. The use of pasta as the carb base may seem novel to some but should not be deem as something unusual or obtrusive. Actually just across the causeway, there is a Johorean version of laksa which uses spaghetti in place of regular laksa noodles as the staple because Sultan Abu Bakar, the great great grandfather of the current Sultan Ibrahim Ismail, loved it so much in the bolognese he had during his travels to Europe more than 120 years ago that he ordered the cooks of his royal kitchen to prepare laksa with spaghetti when he came back from the epic trip. 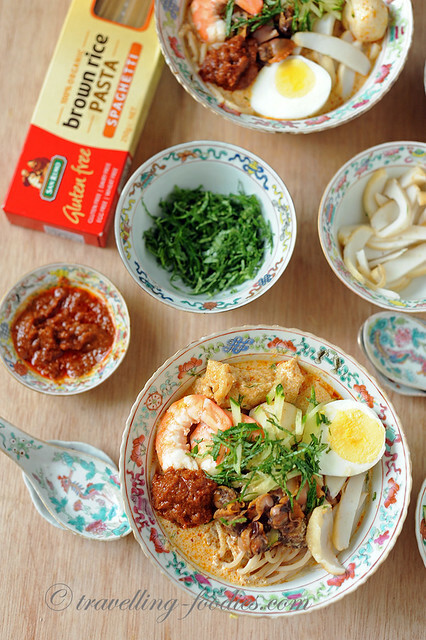 The other ingredients and cooking method in laksa lemak remains largely traditional down to the use of fresh santan and prawn stock as a base. 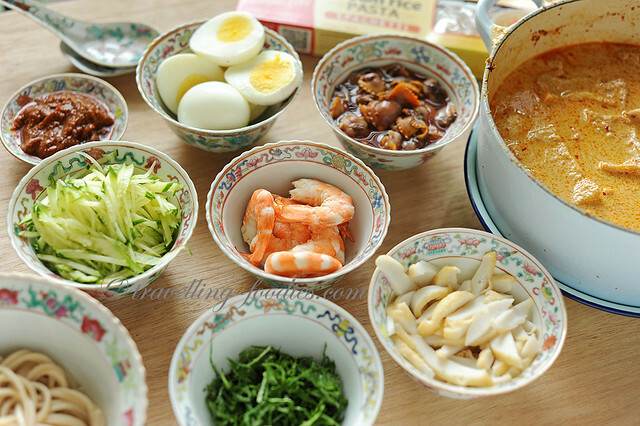 Yes it does take quite a bit of effort to prepare a bowl of laksa lemak the traditional way, from the preparing of the rempah to the making of the prawn stock and finally the assemblage of the condiments. But the results for me, are far more gratifying than eating a bowl of laksa outside. 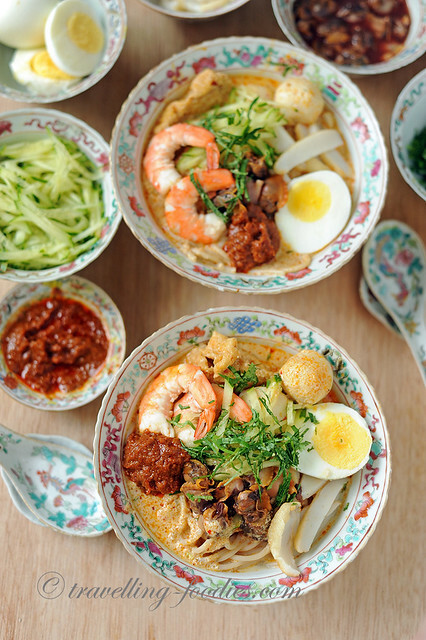 Previous writeups on this blog on katong laksa can be found in the link before which would lead you to the recipe of my laksa lemak should you be keen in cooking it on your own at home. Selamat memcuba! This entry was posted on April 20, 2018 by Alan (travellingfoodies). It was filed under Food, Simple Eats and was tagged with brown rice pasta, katong laksa, Laksa Lemak, peranakan cuisine, peranakan food, san remo, we are family. OMG, makes me so hungry, looks so delicious!!! I’m a Japanese, now resides in Penang. 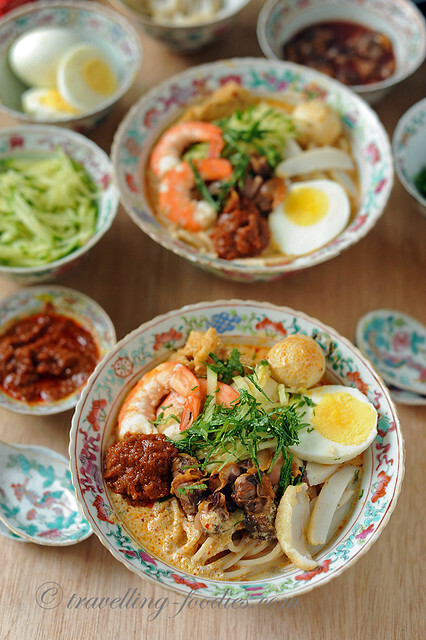 But I always think Nonya Laksa Lemak is the No.1 noodle in the world, not Ramen! Not Penang Laksa. I always miss this type of laksa. You are killing me! Thank you for continuously sharing all your good recipes. I feel God has blessed you with the culinary skill and knowledge and it is right to share with others, such a blessing.